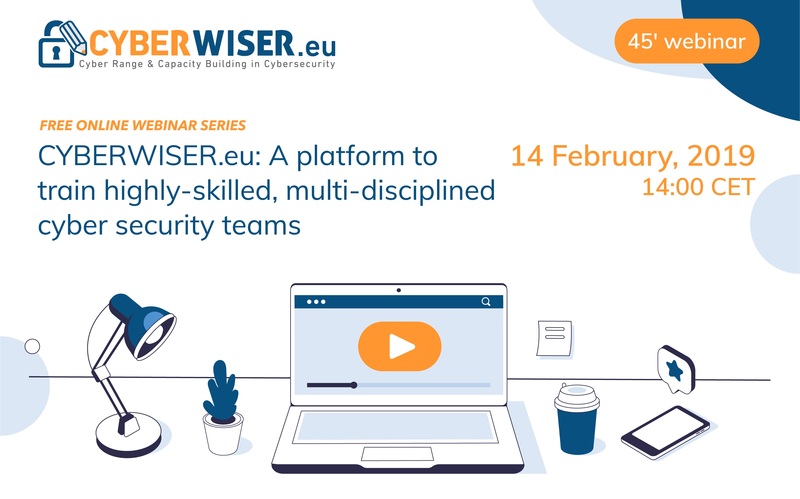 The first CYBERWISER.eu online webinar, on 14th of February, gathered 48 attendees from many diverse backgrounds (both technical and non-technical) with a common interest for cyber security. The webinar's speakers come from three of the project partners: Antonio Álvarez Romero is project manager in the innovation department at ATOS Spain, CYBERWISER.eu project coordinator. Liliana Ribeiro with EDP is one of the three pilots of the project and Matteo Merialdo is project manager in the technology partner RHEA group which operats mainly in the filed of security. The project is an innovation action promoted by the European Commission, for the development of a highly innovative cyber range platform for professional training (it can be used to train cyber security professionals which will have the duty of defending companies from cyvber attacks., but also to raise awareness and develop a cyber security culture across society). For those who are unfamiliar with the concept of cyber range, we are talking about a recent concept that defines a multi purpose virtualization environment - it can vary from a few virtual machines or even a thousand for very complex exercises. Cyber ranges can be instantiated to mimic real environments, thus giving possibilities for training but also for research and developement (for example in space missions) and for penetration tests. The big advantage of cyber range is that it is close to a real environment, so very useful for testing and training purposes, but it is completely safe because disconnected from the real one. Moreover, the freedom offered by CYBERWISER.eu of configuring next generation cyber ranges adaptable to different purposes, is invaluable. The mission of the project is that of fostering the creation of a cyber security culture across the continent and to train professionals with the help of immersive excercises and - affordable - simulated environments that mirror reality. Energy generation and distribution: Energias de Portugal, the major energy provider in Portugal, has over 12000 collaborators; they can be vulnerable to any threat and incident and cyber security is a major concern for them. Railroad transport: Ferrovie dello Stato Italiane will benefit with use cases for technical employees and awareness for non-technical employees. University training: University of Pisa will use the platform for master student's training. Moreover, everyone has hance to participate to the open pilot stream and become early adopter of the platform. The webinar was also a chance for those who are interested in the platform to make questions about it and for the CYBERWISER.eu team to propose a small survey - you will find the survey's results in the images below. Watch the full webinar video here!